Death Star Response Inspiring Future Explorers? The White House response to a petition on building a Death Star (and the resulting media attention) led to some pretty interesting data here at NASA.gov. While the petitioners wanted to focus on a big project done a long time ago in a galaxy far, far away, the response led to thousands of Americans finding out about projects NASA is currently working on right here on Earth and in our Solar System. One example is a reference to NASA’s Spot the Station tool, which helps direct people to where and when to see the International Space Station in the night sky. Over 10,000 people signed up for the tool on Jan. 12, the day after the blog response was posted. Compared to similar periods, NASA saw a 1,400% increase in Spot the Station site usage. Both NASA’s Mars Curiosity and International Space Station pages had their highest traffic days of the month on Jan. 12. Both saw a jump in page views between one and two times the monthly average. The impact on NASA’s Commercial Crew and Cargo Program Office (C3PO) page was huge. Traffic to the site increased about 200x between Jan. 10 – 12. The traffic over that weekend represents more than half the traffic to that page for the entire month. The White House response goes on to mention NASA’s Kepler mission, the Voyager mission, the Solar Probe Plus mission, the agency’s upcoming James Web Telescope, and the free-flying Synchronized Position Hold, Engage, Reorient, Experimental Satellites (SPHERES). One major goal of NASA and the Administration is to encourage students to take interest in science, math, engineering and technology. Maybe the idea of a Death Star petition wasn’t so crazy. Maybe a few future explorers were inspired by some of NASA’s space missions. And if Star Wars fans need something spacey to watch while waiting for Star Wars: Episode VII to arrive in theaters, why not tune into NASA’s YouTube Channel and see some of the amazing things being done by folks here on planet Earth. 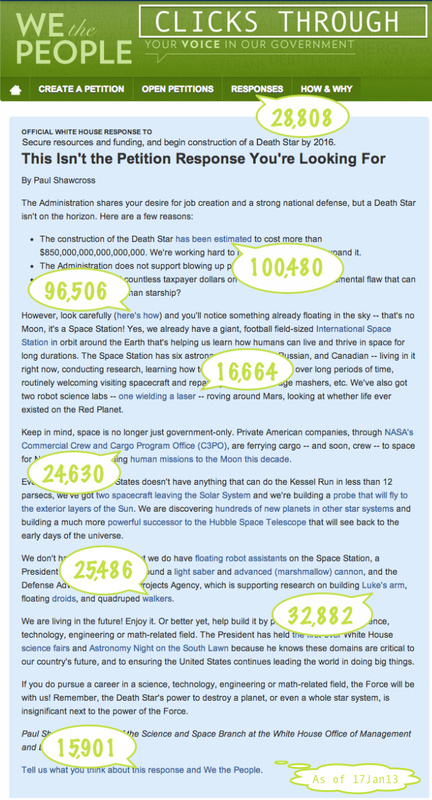 Image Above: The White House response to the We The People “Death Star” petition, with click-throughs highlighted. View the full size image here. What Does &apos;Content As Data&apos; Mean, Anyway? Editor’s Note: Jim Wilson is Senior Producer of www.nasa.gov and served on detail as project manager for the .Gov Reform Task Force, which helped develop the Digital Government Strategy. The newly released Digital Government Strategy calls for a fundamental shift in how government treats digital information, taking an information-centric approach and treating all content as data. But what exactly does “content as data” mean? Many of us probably hear the word “data” and think of a long list of facts and figures or maybe that android guy from “Star Trek.” But here we’re talking about “structured data,” which is just a fancy way of saying we build our content so that it can be read by machines as well as humans. If you’ve ever subscribed to a podcast or an RSS news feed, you were using this idea. So what would this look like, and how could it help the government reach citizens? Well, we already know, because we’re already doing it. Here at NASA, we consume a lot of our own data. This means that we structure things like press releases, images and videos so they can be syndicated across the site and subscribed to by users. 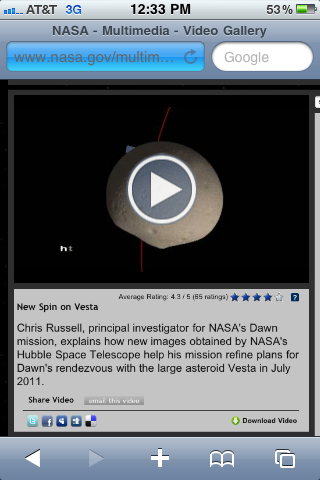 Our entire collection of videos on www.nasa.gov/video is presented this way. Anytime a new video is published, it gets added to the appropriate feed, which automatically get pulled into the appropriate pages, without having to manually add to pages and publish multiple times. 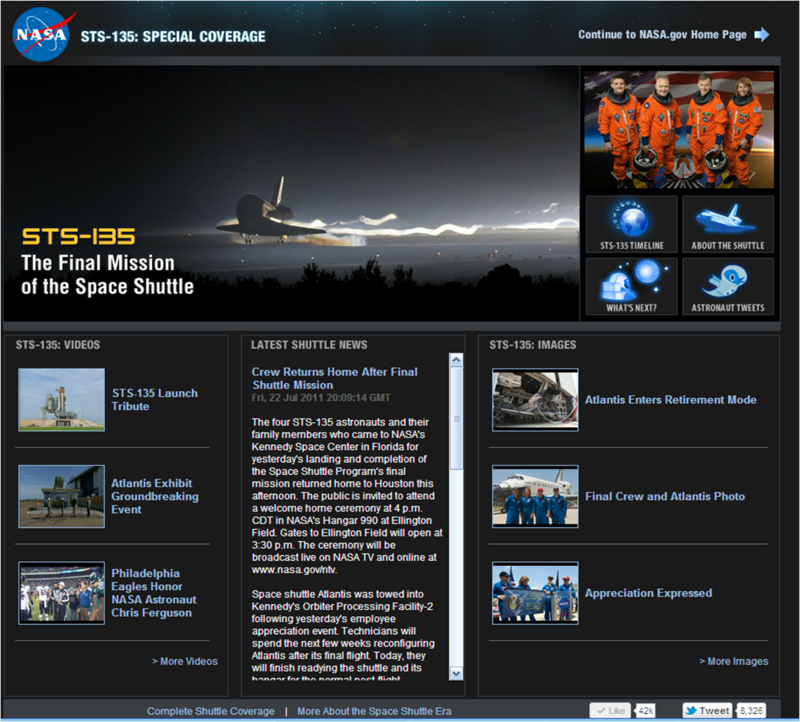 NASA.gov homepage using dynamic feeds to provide updates on STS-135 mission. Our most high-profile use of this technique came during the final flight of the space shuttle in July 2011, when we set up a special version of the NASA.gov homepage with multiple data feeds from around the country. At any given time, users could see a real-time text stream of mission updates, as well as the latest videos and photos from the mission. This information could be updated from multiple sources in Florida, Texas, Washington, DC and elsewhere. And the homepage itself rarely had to be touched. Simply by setting up the feeds, NASA let all the data flow into a single, easily accessible place. The page was tweeted more than 8.000 times and got more than 42,000 likes on Facebook. Another example of this approach is the “create once, publish everywhere” mindset used by the Centers for Disease Control and Prevention to liberate its content from presentation. In other words, you don’t have to go to their webpage and look at the information in their look-and-feel. You can get the information directly from them in lots of different places, on your terms. So how does that work? CDC’s content is structured in tagged so that it can be syndicated and consumed both within the agency and externally. Within its own channels, content is updated once then easily displayed on the main CDC.gov web site, the mobile site at m.cdc.gov, and in the various modules of the CDC mobile app. In 2011, CDC’s liberated content was syndicated to 700 registered partners in all 50 US states, the District of Columbia and 15 countries and accounted for an additional 1.2 million page views. Opening government information in this way has huge potential. Citizens can take content and mash it up to fit their unique needs, while private sector firms can develop government data-driven apps that the government couldn’t build on its own. We want our users to get the content however they want. If it’s good for them to come to our site, great. But if they can get the information they need some other way, just as great. Our mission, after all, isn’t driving up page views to our homepage; it’s providing the best digital information and services to citizens. If you’ve visited NASA.gov on an iPhone, Droid or other smartphone lately, you’ve probably noticed a big difference in the site. First off, you can now play our videos on your smartphone, iPad or similar device. We’ve put a “sniffer” in place that can sense if your browser or device doesn’t support Flash videos, and then direct you to a version of the page which delivers the videos using HTML 5 (image right). Videos from the last month or so are already available in this format, and we’re working to convert the hundreds of older videos over the next few weeks. We figured you’d rather have the most recent videos available than wait for all 1000-plus to be converted. Our next step in the video process is to design a version of the video page specifically formatted for mobile browsing. Even though the videos already play on smartphones, a mobile-formatted page will make it easier for users to find the videos they want. We’re also working on a process for playing videos embedded in feature stories on your smartphone. The video upgrades build on the recent rollout of mobile.nasa.gov, a stripped-down design based on feedback from user testing. The mobile site showcases the latest news and features, the image of the day, and the agency’s Twitter feed, as well as the ability to share content and search the site. As with all of our projects, this is a first step — we’re never really “done.” We’ll continue to listen to your feedback and make changes to the mobile site in the future. NASA was well represented last night at the 14th annual Webby Awards Gala in New York City. Six of us were there, representing the teams behind the three award winning sites: NASA.gov, NASA Home and City 2.0 and Global Climate Change. It’s not our first time as winners (and we hope it won’t be the last), but is was the first time a real-life moonwalker took the stage to accept the award . Few who were there are likely to forget it. 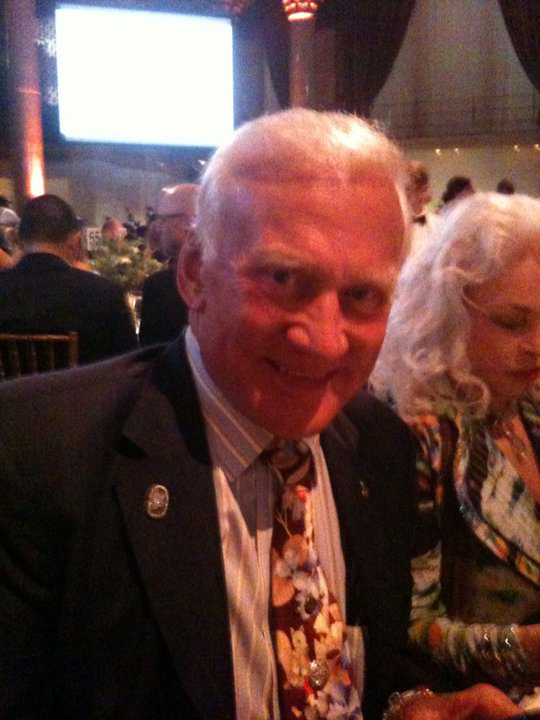 Legendary Apollo 11 moonwalker Buzz Aldrin and his wife Lois joined us at the NASA table at the beginning of the night. From the start, it was clear that the stars of the web world were starstruck by Buzz. A steady stream of admirers lined up for handshakes and photos throughout the night. There were plenty of celebrities on hand for the event, but it was clear that Buzz had an entirely different level of star power. Near the end of the evening, Buzz was called to the stage to accept for the three NASA groups. Even before he took the stage, the crowd and other awardees cheered him on (with some sometimes colorful language I can’t share here). Once he was announced, the room erupted with a standing ovation and sustained applause that outshone any other moment of the night. After some playful mugging for the cameras, Buzz gave the traditional 5-word Webby speech: “Humanity. Colonization. Phobos. Monolith. Mars!” (see it on YouTube). It’s easy sometimes for those of us who work at NASA to start to see it as routine. It is after all, a job for us, with the ups and downs and stresses of any other job. But events like this remind us that what we do is just inherently cool to the outside world. The Apollo 11 landing happened before many of the people in the room were even born, but Buzz still has the power to inspire, because of the simple but awe-inspiring fact: He traveled a quarter million miles from Earth and walked on the surface of the moon. All in an age before the technology behind the Webby Awards even existed. If you haven’t seen it already, check out our new video page at https://www.nasa.gov/videos. We feel like it’s a pretty big step forward, but as always, we want to hear what our users think. We’ve heard you loud and clear over the years — in mail, tweets, and other communications everyday from every corner of the globe. And one of the most frequent complaints has been the way we presented videos. The biggest challenge has always been how to deal with multiple formats produced by various video teams at NASA Centers all across the country. Just a few years ago, we simply opened videos using the “native player” — a .mov opened with QuickTime, a .rm with RealPlayer, a .wmv with Windows. There was no context; videos were presented one at a time and not grouped with other videos. A few years later, we developed a standard video player that at least grouped our videos together and automatically detected a users settings, but still required various browser plug ins to see all the videos. We still weren’t quite there. So we pulled together a working group made up of some of the agency’s web editors, technicians, and video professionals to gather requirements. It was pretty clear from their work and from your comments that we needed a single format for all videos. So we evaluated several commercial off the shelf technical solutions, made a selection, and began the transition to Flash-based video. Now, visitors to NASA.gov can finally view our videos without the need to install multiple plugins — all you need is a Flash player. 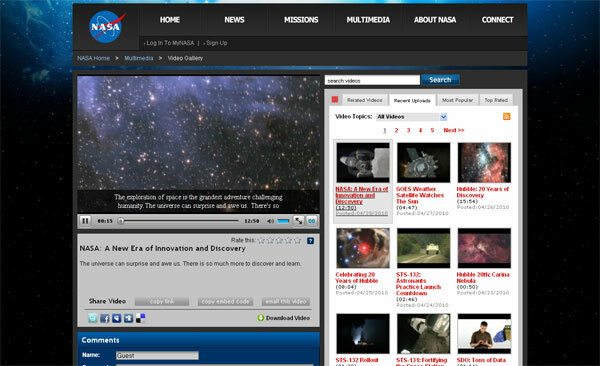 The videos are displayed in several ways, from recent uploads to topics such as “Solar System” or “Earth.” Users can search for a video without leaving the video page, or browse by most popular and top rated. In addition to rating, viewers can also comment on videos, download them to their local computer, share with a friend via e-mail and social networks, or copy the embed code to post in their own blog. Many of these features will be familiar to you if you look at any video sites on the Web today. While video may seem like an easy thing to fix in the age of YouTube and other video sharing sites, it can get pretty tricky for a large organization like ours. We certainly wish we’d gotten here sooner, but we’re glad to be here now. As always, we’ve still got a few things on the drawing board, and we’d love to have your feedback. There was something different this time. From the veteran reporters and public affairs officers at the NASA News Center to mission managers in the firing room, NASA’s Kennedy Space Center was buzzing about the fresh burst of enthusiasm as the clock ticked toward liftoff of Atlantis on STS-129. 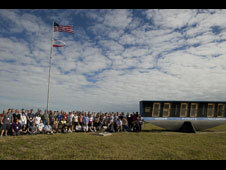 In the shadow of the iconic Vehicle Assembly Building and just a quick stroll from the famous countdown clock sat a white tent filled with 100 NASA Twitter followers from 21 states, the District of Columbia as well as Canada, England, Morocco and New Zealand. They came to Florida from all over for a two-day Tweetup (an informal meet-up of people using the social media tool Twitter), including a tour of the center and a chance to talk to the people that help send the shuttle to space. They got an up close look at shuttle hardware and face-to-face time with astronauts and reporters. Some were pleasantly surprised to become part of the story themselves, as members of the news media came looking for interviews. So what’s all the fuss about? Think of Twitter as an ongoing conversation with a few thousand of your closest friends. There may have been only 100 “tweeps” in that tent, but many more were following the conversation using the #nasatweetup hashtag (988 according to one metrics site). The people who attended have more than 150,000 followers among them. And many media outlets reported on the event, spreading the excitement even further. It’s not just “how many?” but “who?” Some web users, no matter how much they’re interested in space, aren’t coming directly to NASA.gov for their news. There’s a whole generation of web users who get their news and share their interests on social media sites. Engaging with them on Twitter, Flickr, Facebook, YouTube and other sites is bringing the story of NASA to new audiences that may not otherwise connect with us. Tweeters who came to NASA Headquarters in October got to talk live to the International Space Station, and others have talked with shuttle crews and scientists exploring Mars and Saturn. About a dozen NASA Astronauts are tweeting already, sometimes from orbit. One — Mike Massimino (@Astro_Mike) — has more than a million followers. You can find NASA Twitter accounts and other social media efforts on the NASA Connect page. Let’s keep the conversation going. Author Jim WilsonPosted on November 19, 2009 March 22, 2013 Categories UncategorizedTags Social Media, What's Happening8 Comments on Tweet,two,one … Liftoff! This blog is not being updated for the time being.